A winter project complete! Well it’ll never be complete, ever! But that is the ‘enjoyment’ of owning an old Brit Iron Moto. Took ‘er out for a shake-down and found the new stopper working very well; no fade; a nice feel with my typical couple of fingers feather braking. Still a little electrical gremlin to chase out of the chassis; they like to hibernate in Triumphs stored in dark dry garages! 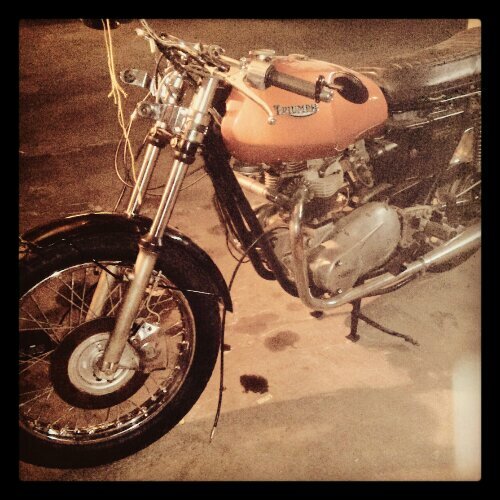 Nevertheless, the bike kicked over easily after sitting up for the winter. Should now get an early start this coming riding season. A good couple of hours was spent this afternoon reattaching the front end to my bike. The ‘new’ triple tree was threaded back onto the frames head tube, making sure plenty of grease was slathered into the races. Then the fork stanchions slid back up the fork holders. Wheel mounted and a few more bolts tightened. That makes it sound easy but a few reassembly hurdles had to be surmounted. Just the brake plumbing to finish, test drive double-check connections then the job’s a gud-un! Ah le lapin: un cadeau! 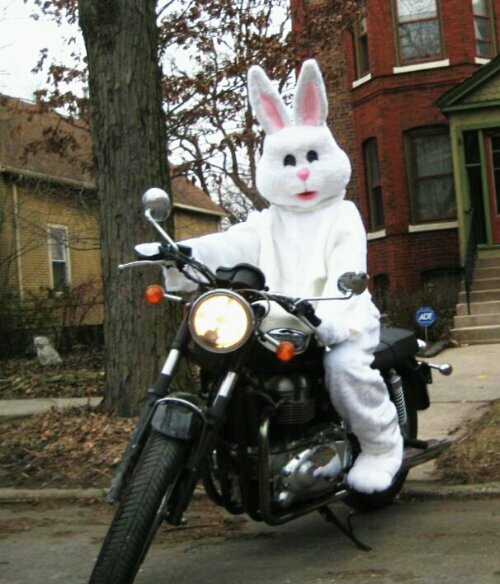 When you need to be chased by a greyhound then dress in a white rabbit outfit hop on a sweet Triumph Bonnie and then go like a hare! Well it is easter and I’m sure the magicians top hat prop seemed like a good idea at the time. My front end project nears its final lap! 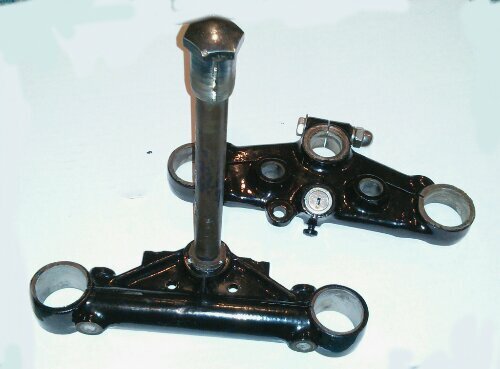 My triple tree was returned from the powdercoaters; the grotty item acquired from EBay was bead blasted then given a nice new glossy finish just like it would have looked like from the Midlands factory thirty some years ago. Couple of new bolts to purchase for the lower fork pinch then I can assemble… My easter weekend is fettled for spannerin’ ! 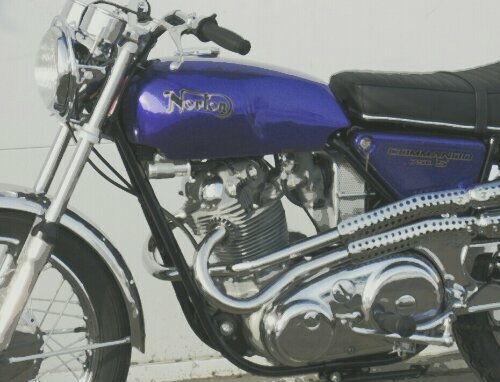 The Seven Fifty Norton Commando sure look like a nice machine; especially when it is adorned with the high scrambler pipes. The engine geometry, though a twin like the Meridan Moto it has a definite look of its own. Given a modern engineering makeover this ride can be an enjoyable vintage experience. This example is from Zaps up in Minnesota. Interesting purple color. Me? I like the classic gloss black with gold logo and pinstripe. Don’t turn your back on the bike! Here’s a lady rider with a bobb’d chopp’d, ape’d & defender’d Triumph moto. 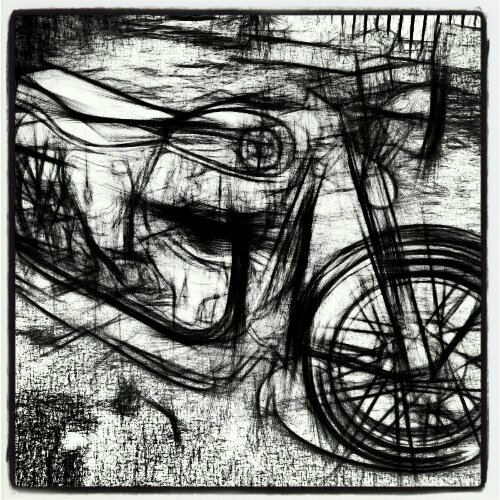 Nicely composed image, subject and portrait of a bike and its owner. Always stretch before or after rigorous exercise! How low can you go! 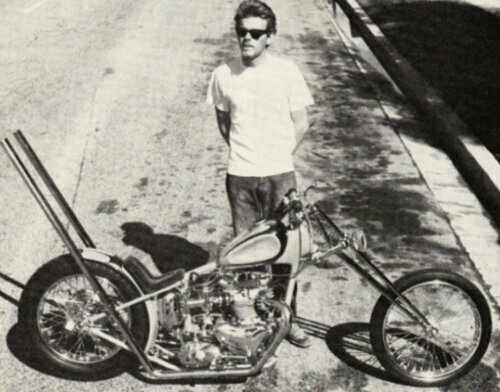 Stretched, long-legged, chopper with a Brit-twin engine. Looks “good” in profile but bet it steers like a bus. Straight desert roads heading off into the horizon. The pipes look like they came straight from a church organ; and the seat a prayer stool. More tea vicar? Well, at least have some with scones lashed with cream! Thruxton. The café racer. Reinvented. 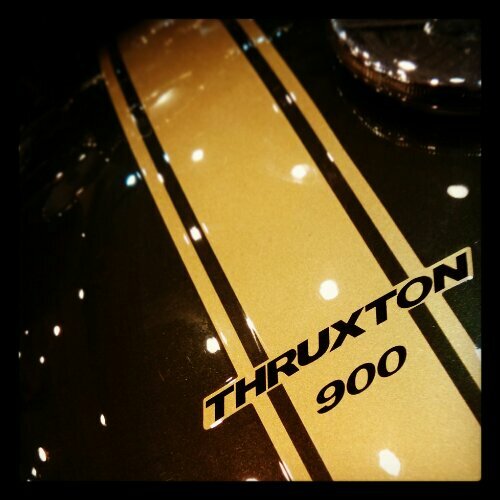 Thruxton. 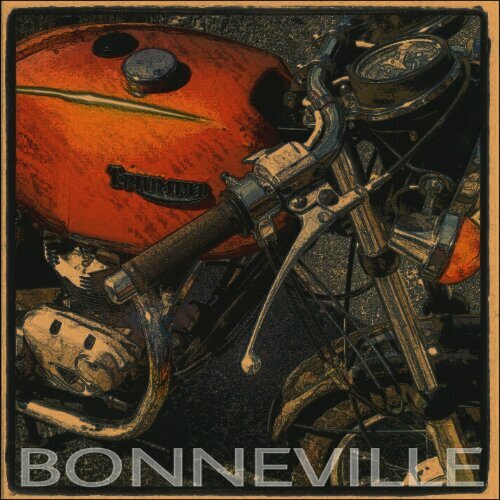 Named after the race track where Triumph ruled the roost and inspired by the famous “Ton Up Boys” of the 60s. 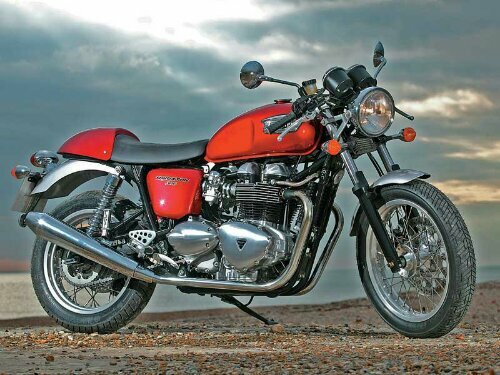 The Thruxton is Triumph’s sportiest classic, an authentic café racer delivering that unique Brit twin riding experience. Low rise bars, sporty riding position, aluminum-rimmed spoked wheels (18” front and 17” rear), megaphone style exhaust and a modern 865cc parallel-twin engine. It stirs the heart for those around at the time and for those who seek the classic sporty retro cool. Now where is that 3/8″ spanner? 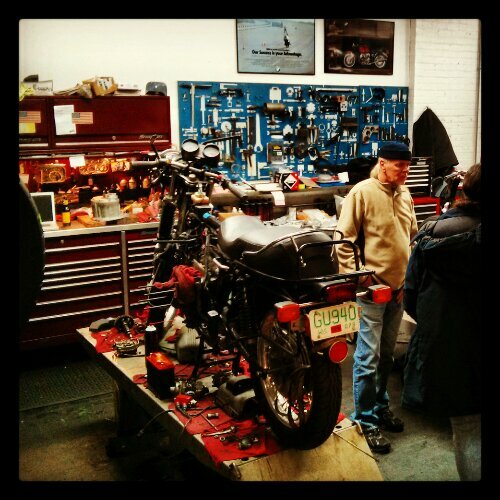 Here’s one of the mechanics stations down at Motoworks. Jealous? Me? Sure! 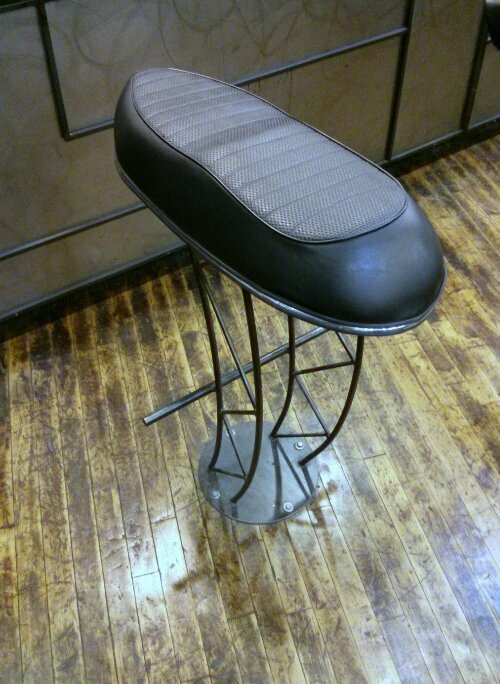 There was a line of stools at Motoworks along the counter; bolted down with peg footrests they gave the sweater/rider a motorcycle pew to plop their backside on. 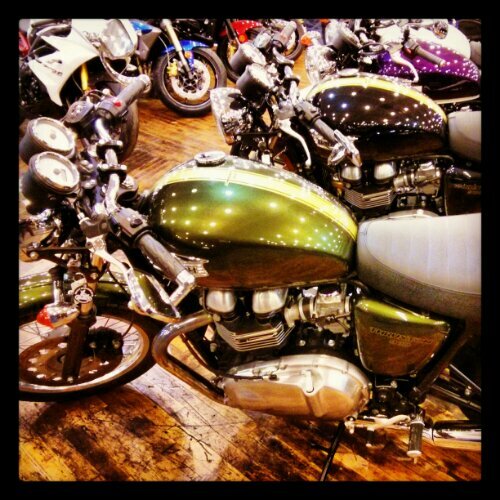 This Triumph one caught my interest. Love it! Get t’kettle on wor kid! Nowt like a good cuppa when yer get ‘ome from work. 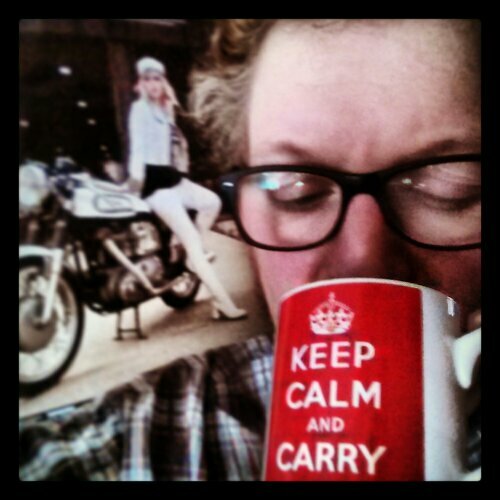 Image behind me is a poster picked up at Motoworks last evening; it’s an image of Larry Fletcher’s Triton complete with lovely lass. All I need is a chocolate digestive to dunk in then I’m set! 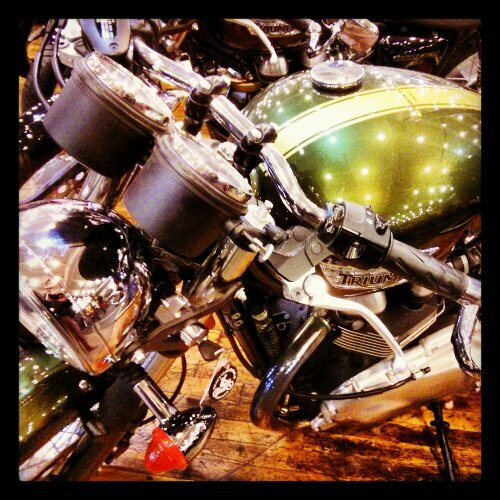 An open evening at the Chicago Triumph dealer Motoworks on south Western. A good chance to see the latest line-up of the superb models available. 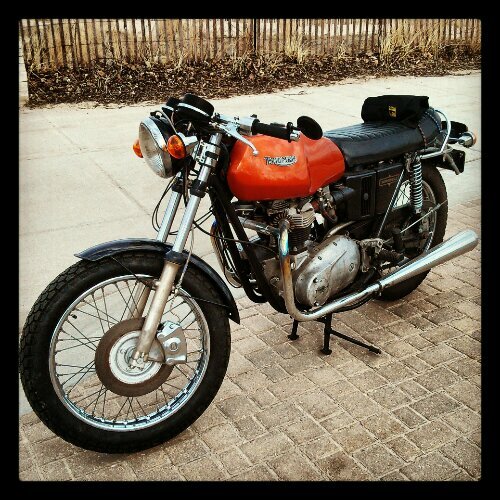 The Bonneville, Daytona, Tiger, Scrambler, Street Triple… But I was drawn towards the low bar’d and rear set’d Thruxton. It has a delicious sparkly green color with gold stripe. Here are some photos… Enjoy! Better start saving my pennies! 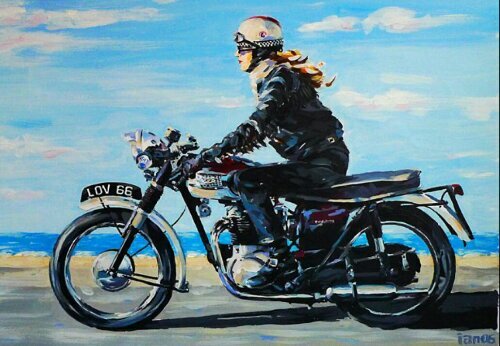 Stumbled upon this fab painting of a gal riding a Bonnie along a sunny coastal road. Great color, simple daub-work, and perfect subject. Need to get out my oils and canvas and get back to some paintin’. Rocket Gold Star: just a few lines can evoke the classic lines of this great bike. Oh I wish I still had it! My few photos are all that give me the memories.